I don’t know how you American mums do it every single day!? Last week (on the rainiest day ever) Alec had his very first nursery school outing. They went to our local park and pretty much spent most of the morning indoors since it was raining like crazy. We were told to dress them for the weather and send along a packed lunch. I panicked. 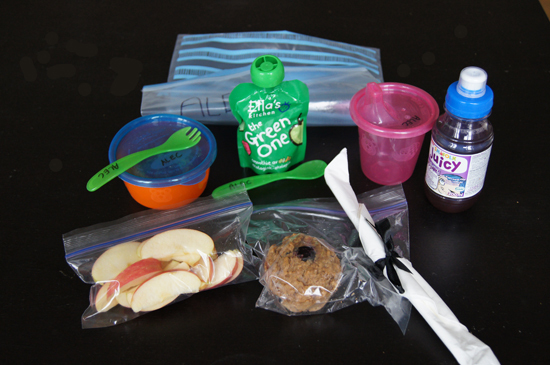 What do you send along that a 2o-month old can manage to eat on his own that will also be fresh and inviting after a few hours in a lunchbox? They already have a fruit snack in the morning and a sandwich snack in the afternoon, so I didn’t want to give Little A another sandwich in his lunch. And I was concerned about sending along cookies or similar assuming that he wouldn’t be eating much else if I did. 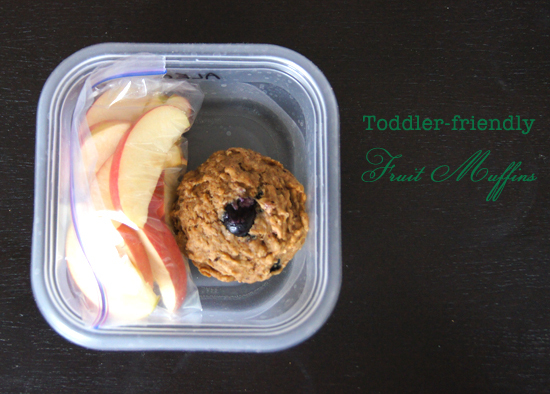 After a little research and some changes, I came up with this recipe for completely sugar-free, really healthy, packed with fresh fruit, muffins. These are not really sweet so they are the perfect toddler snack or even breakfast (I have been having them for breakfast). And they are nice and moist so would also be perfect for babies. You can vary the fruit and/or use frozen berries etc if you like. Whisk together bananas, apple, butter, prune juice, oat meal and egg. Add dry ingredients and mix. Spoon batter into muffin tray and bake for around 30 minutes or until golden. Makes a dozen yummy muffins!